No more winding! This watch uses self-winding, but in order to keep it wound you need to wear it just about every day. It uses an automatic movement with a balanced wheel, instead of a quartz movement. So the down side is that it may be off a few seconds each day, but most people find this is no big deal. It has luminous hands and markers, a beige nylon band and an ivory dial (lighter than the picture). The low cost makes this a great value, and most guys who have one love it. 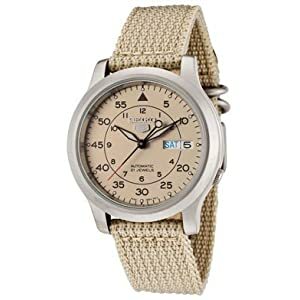 This is a no-frills watch for guys who like utilitarian stuff. The only drawback is the watch band. The nylon band will probably need to be replaced with a more durable leather band in 4-6 months.